Linking up to Monika over at http://needleandthreadnetwork.blogspot.com/2015/10/wip-wednesday-214-tn.html. Well, remember this one from last week? Yes!!! Well, I finished it on Sunday and bound it last night. And before I could even take a picture of it this morning...the owner was at my door to see how things were going. Of course, she took it home..with me forgetting the picture!!!! But she was thrilled with it!!!! This lovely one is arriving this week for me to hand quilt for a friend. In the meantime, I am piling hardwood in for winter...so, not bored yet....lol. This afternoon, I helped a good friend go through her sewing supplies. She isn't well, and can't work at her machines anymore. It wasn't an easy thing to do, but we got things taken care of. She has a serger and a Pfaff 2046 to sell now. Gosh...that had to be a difficult task! I'm sure she was thrilled to have you help her with sorting through the sewing items. 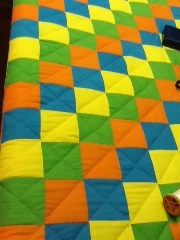 That colour combination you chose for your quilt simply POPS off the TN&TN linkup page! It's gorgeous! Thanks for posting the Halloween Haunts hop - I must make some time to look at the many posts. 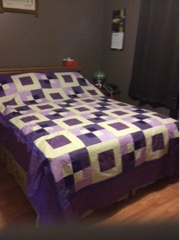 looks like a big job to hand quilt that lovely purple quilt! Congratulations on your finish! Can't wait to see your Halloween Haunt!